Do you have any support for Google Assistant? It’s a bunch of messages that play after dismissing the alarm with the stock clock on the Pixel XL Android 9.0. I’ve attached some photos. I noticed it when looking at the clock app. 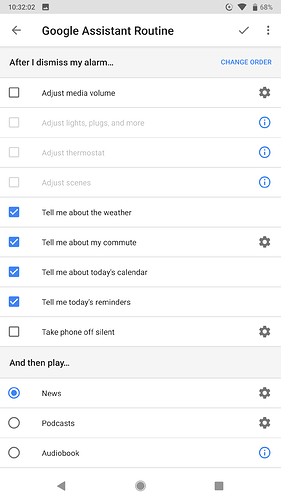 The settings on the Google Assistant Routine are the default ones when turning it on. I don’t know much about coding but I’ve thought of two things. Either implement it in Sleep’s alarm, or Sleep could create at alarm at the correct wakeup time (or change the time of a pre-existing time if you can’t create it, I don’t know if you can change it either.) But this was a really nice thing to wake up to. The calendar stuff, the reminders I have. I would really like it being put into the Sleep application. Is there anyway you can do this? Like is it possible or does Google have it where it’s impossible at the moment?